The famous basketball star Stephen Curry is a two-time NBA champion and two-time league MVP, but he hasn’t always been considered a superstar. The American professional basketballer is associated with the Golden State Warriors of the NBA and is worth $77 million. He earns his net worth from salary and other endorsements. Learn more about his wife, daughter, family, parents, brother, bio, NBA career and other interesting facts below. The basketball prodigy married his longtime girlfriend, a Toronto native Ayesha Alexander. Ayesha is a Canadian-American actress, television personality as well as a celebrity cook and cookbook author. The couple met while in a church group in Charlotte; at the time, they were fourteen and fifteen years respectively. After several years of successful relationship, the couple tied the knot on July 30, 2011, in Charlotte. Together, they have two daughters, Riley born in July 2012 and Ryan that was born in July 2015. However, Curry’s wife announced her third pregnancy in February 2018. The perfect couple currently resides in Walnut Creek, California with their amazing children. Curry’s family is regarded as one of the cutest and adorable families in the NBA. Not every reporter enjoys having kids during a press conference; nevertheless, for Steph Curry, you need to get used to it because he never goes to the conference room without his daughter Riley. His adorable daughter has always followed him to the conference room since she was two. Her popularity has continued to increase following her numerous acts while in a press conference. In one of the press conferences held in 2015, Riley stole the show by singing the popular Drake and Big Sean‘s song titled Blessings. Her awesome rendition was applauded by the reporters and also caught the attention of Drake who later posted the video on Instagram. Stephen Curry’s family has been very supportive, his wife and kids are always on the court to cheer him in every game. The amazing couple often shares their awesome moments on social media including their hilarious vacations to their courtside antics. Curry is the eldest child of the former NBA player Dell Curry and his wife mom Sonya Curry, a former Division 1 Volleyball player. The duo taught Steph and his siblings the rudiments of the game. While Dell takes Stephen and his brother to the games, Sonya, on the other hand, instills discipline in them. At the moment Stephen is currently regarded as one of the greatest shooters in NBA history. Curry’s younger brother named Seth Curry is also a pro basketball player with the Dallas Mavericks of the NBA. His only sister Sydel trails the same career path as her mother and she currently plays volleyball at Elon University. He was born on the 14th day of March 1988 in Akron, Ohio, to Sonya and Dell Curry – a former professional basketball player who retired as Charlotte Hornets’ all-time leader in points. It’s well known that Stephen Curry attended Charlotte Christian high school and led his side to three conference titles. Stephen wanted to walk in his father’s shoes. Like Dell, he wanted to play for the Hokies. But then, Virginia Tech was only willing to hand him an offer as a walk-on player. This motivated Curry to join Davidson which had not won an NCAA Tournament since 1969. His instrumental performance with his side in the NCAA tournament got him a spot in the national team that played FIBA U19 World Championship in 2007 where his side finished second. Curry’s amazing game plan saw Davidson win against the then elites of the game like Gonzaga, Georgetown, and Wisconsin. This ultimately improved the status of Davidson to a greater extent. In return, Stephen Curry attained the status of the most outstanding player of mid-west in 2008. More to that, he was voted the breakthrough player of the year 2008. The all-time Davidson College leader in points was selected by the Golden State Warriors. As it happened, he was the #7 pick in the 2009 NBA draft. He signed a $12.7 million contract in 2009 and made his debut that same year in October against the Houston Rockets. Curry would later be voted second in the NBA Rookie of the Year Award 2009-10 behind Tyreke Evans after averaging 17.5 points for the season. Often considered to be one of the greatest shooters in NBA history, Stephen Curry holds numerous three-point shooting records. He signed a $44 million contract extension for four years in 2012 and became one of the most sought NBA players. So far in his professional basketball career, Curry has been able to accumulate fine stats that show he’s an awesome basketballer. As at the time of this report, he could brag about having 26.6 points and 5.2 rebounds. You can check out further details of his stats here. As a two-time gold medalist in the USA senior basketball team, Stephen Curry earns $12 million in salary every year. In 2017, Curry was listed in Forbes’ 100-list of the world’s highest-paid celebrities. With an earning of $47.3 million, the 29-year-old basketball player was spotted on the 42nd position of the list. Curry’s $12.1 million salary for the 2016/17 season was the 85th highest in the NBA. While the NBA’s new collective bargaining agreement made it possible for Warriors to pay Curry more than $200 million over five years, the point guard player had the NBA’s best-selling jersey in the past two seasons. “His off-court income has nearly tripled over the past 12 months. Curry signed endorsements with JPMorgan Chase, Brita, Vivo and PressPlay since the end of 2015…,” read the Forbes report. 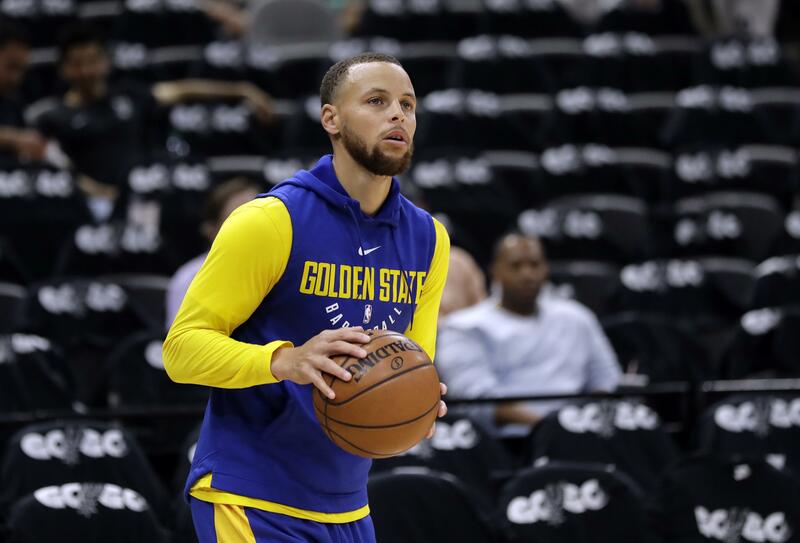 In another annual report which looked at the world’s highest-paid athletes, the American business magazine detailed that Stephen Curry’s endorsement earnings are soaring at the same time his salary is exploding. Undoubtedly, Curry has been the best bargain in basketball over the past four seasons. Records have it that he earned $44 million while he led the Warriors to three straight NBA Finals. Disregarding that, it is believed that he pocketed $35 million from endorsements and royalties in the 2016/17 season alone. This was enabled by his deals with JPMorgan Chase, Brita, Vivo, and PressPlay. Although the worth of Curry’s deal with Under Armour is unknown to the public, it has circulated that the basketball player could worth $14 billion to Under Armour. Curry has been severally acknowledged as the factor that triggered the impressive hike Under Armour is experiencing with its basketball shoe sales. His popular signature shoe deal with Under Armour would last until 2024. Curry ranked No. 6 among the top-paid athletes at $47 million from salary and endorsements. It is anticipated that he will make more than $80 million in the 2017/18 NBA season, including endorsements and royalties. Not long past, the NBA’s first unanimous most valuable player offered his San Francisco Bay estate for sale asking $3.7 million. The property brought in $3 million when it was sold. Curry is widely known for his partnership with Under Armour, where he is considered to be the “face of their footwear line”. Originally signed to Nike, Curry joined Under Armour in the 2013 offseason. As Curry became MVP and one of the most popular athletes in the world, sales of his shoes have become a major factor for Under Armour with stock prices rising and falling based on the success of the Curry shoe line.